Colosseum is a local multiplayer party game for up to four players. In the amusement arcade “Colosseum” you meet up with your nerdy friends and choose one of the various arcade machines to play together cooperatively or competitively. Explore the arcade, choose your game, set your controls and prepare for the fun. Put on your archer costumes and join your friends in the fight against dangerous creatures in “Boss Rush”. Each boss has his own skill-set and minions, who are intent on helping their master. Next up: “Mace Knights”. An action packed PvP-Arena where you face off against your friends whirling a spiky mace. Try to hit the other players before they get you. You can change the range of your mace and collect power-ups to coordinate and boost your attacks. The third and last machine (for now) is “Gem Thieves”. Slip into the role of a master thief or a security guard in a museum full of treasures. As the guard you are trying to find the thieves who are hiding in the darkness. Stop and catch them with your flashlight and taser before they rob the museum of all its gems. Thieves: Try to stay invisible and avoid the lights, but be quick about it, your fellow robbers are doing the same. Grab as many gems as you can get your hands on and carry them to the exits to score the most points. Welcome to the second issue of Through The Arcades. After last week's first edition, we take it you are well informed about this brand new article series. So let us jump right in! Above is the first trailer we made for the game. Some of the footage is already outdated, as the game is still in development and everything is subject to major changes, but it should still give you an idea what Colosseum looks and feels like at the moment. We had a major event last week, so we invested a lot into getting a build done, that was ready to be presented. That means we fixed a lot of bugs, turned some knobs and spiced up the presentation here and there. People had great fun playing the game and testing the different gamemodes and we got some valuable feedback, so expect to see some interesting updates and usability improvements in the next few weeks. 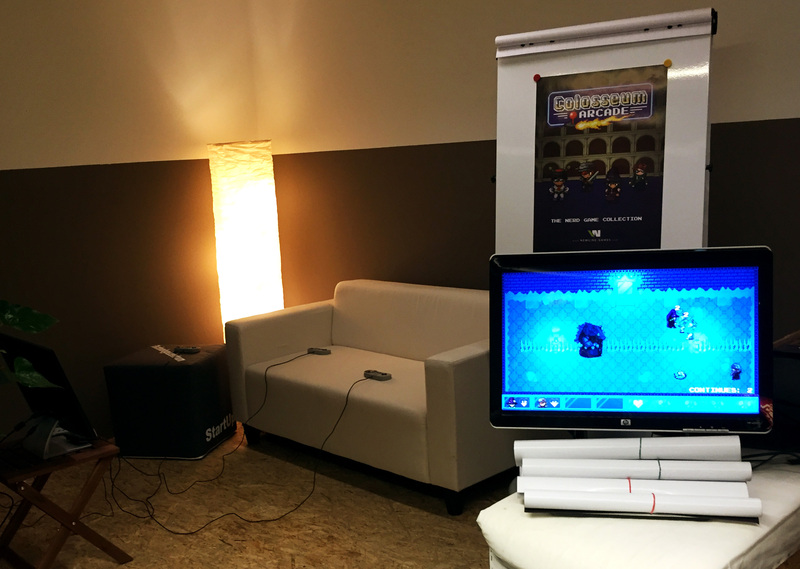 Furthermore, we applied some big changes to the GemThieves mode. Feel free to take a look at one of the new map designs. Do you see any gems? Neither do we. That is because they are hidden in the cabinets. You can take a peek inside, but it might not be the kind of jewel you were looking for. Also, those big closets come in handy when the drones approach. They are safe to hide in before you are spotted and things go sideways. But don't take a nap in there, your opponents won't wait for you! Finally, as you might have guessed, that huge light in the middle is not for ornamental purposes. If you think those armored statues and vases are nothing but decorations though, you are going to be in for a surprise! Stay tuned to find out more on this matter and many other changes in next week's issue of Through The Arcades. If a weekly newsletter is not enough, don’t forget to follow us on Facebook and Twitter to stay informed on a daily basis! The second issue of our article series "Beneath The Pixels." This time we will take a look at the cast of characters you get to play as in "Colosseum".